Baadshaho Trailer Out: Emraan Hashmi, Ajay Devgn Starrer Is A Crazy Mix Of Politics, Romance And Crime! The much-awaited badass action-packed teaser of Milan Luthria’s ‘Baadshaho’ starring Emraan Hashmi and Ajay Devgn in lead roles is finally out. 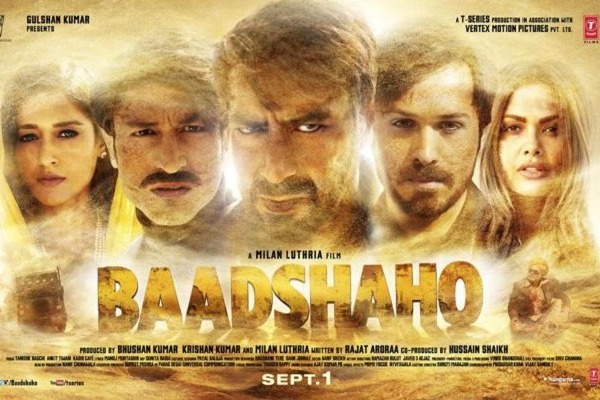 Set against a backdrop of the 1975 Emergency, Baadshaho promises a perfect mix of politics, romance, action, crime and lot of sizzling scenes. The film tells a story of six badasses including Vidyut Jamwal, Ileana D’Cruz and Esha Gupta who are on a mission to loot a truck full of gold reserve. With 96 hours in their hands and 600kms to cover, Ajay Devgn and his gang go to every extent to accomplish their target. In the 90s backdrop, Sanjay Mishra, who is the 6th badass of the gang, is a surprise package in the teaser. Emraan Hashmi is back at his best in bold avatar and is evident with the dialogue, “Sharam aur mein toh ek sentence me nahi aate Madam!” While Emraan Hashmi will be seen romancing Sunny Leone, Ajay Devgn raises the temperature with his bold acts with Ileana D’Cruz. PICS: The Royal Nawabi Look of Shahid Kapoor and Mira Rajput At London Wedding Is Redefining Fashion! We wonder if teaser has hit the right chord, what impact this film can leave on the audience. The film marks the fourth collaboration between Ajay Devgn and Milan Luthria and we are already looking forward to it. Photos: Shah Rukh Khan’s Daughter Suhana Steals The Show, Alia Bhatt, Jacqueline Sidelined! Previous : PICS: The Royal Nawabi Look of Shahid Kapoor and Mira Rajput At London Wedding Is Redefining Fashion! Next : Selfie Time – This Pic Of Shahid Kapoor With Wife Mira Rajput Is So Lovable!